Professor Ekaterinaris obtained his B.Sc. in Electrical and Mechanical Engineering from Aristotle University of Thessaloniki, in 1977. He received his M.Sc. in Mechanical Engineering in 1983, and his Ph.D. in Aerospace Engineering in 1987, both at the Georgia Institute of Technology. 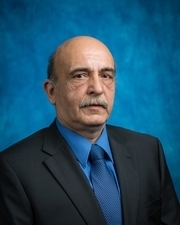 Professor Ekaterinaris has worked at NASA-Ames Research Center, Moffett Field CA — through the Navy/NASA joint Institute of Aeronautics — since 1987, and at the same time was faculty at the Naval Postgraduate School at Monterey. He spent more than a year (1995-1997) at RISOE, Denmark's national laboratory (wind energy department), and then worked at Nielsen Engineering and Research (1997-2000). He returned to Greece, and he became professor at the school of Mechanical and Aerospace Engineering of the University of Patras. His interests are methodology development in computational mechanics, including aerodynamics, magnetogasdynamics, flow transition, turbulence research, flow structure interaction in aeronautics and biomechanics and multi-scale phenomena. Technology, and associate editor of the Journal Progress in Aerospace Science. 1. Toulopoulos, I. and Ekaterinaris, J.A., "High-Order Discontinuous Galerkin Discretizations for Computational Aeroacoustics in Complex Domains,"
AIAA Journal, Vol. 44, No. 3, 2006, pp. 502-511. "Decoupled fluid structure approach for estimating wall stress in abdominal aortic aneurysms," Journal of Biomechanics, Vol. 40, No. 2, 2007, pp.367-377. 3. Arabatizis, G., Vavilis, P., Toulopoulos, I., and Ekaterinaris, J. A., "Implicit High- Order Time-Marching Schemes for the Linearized Euler Equations," AIAA Journal, Vol. 45, No. 8, August 2007, pp. 1819  1826. 6. Kovanis, A.P., Skaperdas E., and Ekaterinaris, J.A., "Design and Analysis of a Light Cargo UAV Prototype," Journal of Aerospace Engineering, 2011. "Accelerating the Simulation of Brain Tumor Proliferation with Many-core GPUs,"
interaction hemodynamics in a zero-pressure state corrected arterial geometry,"
Journal of Biomechanics, Vol. 44, No. 13, 2011, pp 2453-2460. 10. Karantasis, K., Polychronopoulos, E., and Ekaterinaris, J.A., "Acceleration of a High Order Accurate Method for Compressible Flows on SDSM based GPU Clusters,"
11. Kyrkos, A. and Ekaterinaris, J. A., "Assessment of an unstructured mesh approach for CFD predictions of the NH90 fuselage rotor," GOAHEAD special issue, Aerospace Science and Technology, 2012. 12. Konztialis, K. and Ekaterinaris, J.A., "High order discontinuous Galerkin discretizations with a new limiting approach and positivity preservation for strong moving shocks," Computers and Fluids, 2012. 13. Konztialis, K., Panourgias, K, and Ekaterinaris, J.A., "A p-adaptive limiting approach for DG discretizations on mixed type meshes," Computer Methods in Applied Mechanics and Engineering, 2012. 14. Vavourakis, V., Kazakidi, A., Tsakiris, D., and Ekaterinaris, J.A., "A non-linear dynamic finite element analysis of skeletal muscles and muscular hydrostats," Computer Methods in Biomechanics and Biomedical Engineering, 2012. 15. Kazakidi, A., Vavourakis, V., Tsakiris, D., and Ekaterinaris, J.A., "Octopus arm hydrodynamics," Journal of Experimental Biology, 2012. 1988 - 1995 Research Scientist, NASA/Ames Research Center, CA. 1990 - 1992 Assistant Research Professor, Naval Postgraduate School..
1992 - 1995 Associate Research Professor, Naval Postgraduate School. 1995 - 1997 Senior Research Scientist, RISOE National Laboratory, DK. 1997 - 2000 Senior Research Scientist, NIELSEN Engineering and Research,. (FORTH), Crete, Greece, collaborating professor with FORTH/IACM. (iv) applications of computational mechanics to biomechanics and bioengineering. - Development of High-Order Accurate methods for Rotor Aerodynamics, 1998-2002. Funded by NASA-Ames Research Center, Moffet Field CA. - Know-Blade EU Project for Wind Turbine Aerodynamics, 2001-2004. Funded by the 5th Framework EU program. - Computational Prediction of High Speed Jet Flows, 2004-2007. - GOAHEAD, EU STREP project on Helicopter Aerodynamics, 2006-2010. Funded by the 6th European Community (EU) Framework Program (FP6). - UFAST, EU STREP project on shock boundary layer interaction, 2006-2010. Funded by the 6th EU Framework Program FP6. Funded by the European Army Research Office (ARO), London. of Air Force Office of Scientific Research (AFOSR), London. dynamic stall simulations on unstructured meshes, 2010-2012.
high speed plasma flow simulations. Funded by the European Space Agency (ESA), 2011-2013. Behaviour of the Octopus, 2009-2013. Integrated Project (IP) Funded by the EU 7th Framework Program. - Fluid structure interaction for large scale wind turbines, 2011-2014. Greek National Strategic Reference Framework through EU funding.